E-learning, if done right, can be a fun, engaging, and interactive training method. E-learning narration, if done right, can add an extra layer of interest to keep the learner engaged. However, if your e-learning narration is not done correctly, it can distract your learners. In fact, learners may become so annoyed with your narration that they cannot pay as much attention to the actual course content, which can lead to lower knowledge retention. They may also be more reluctant to complete the course, or any other course you create. Instead of drawing the learner into an immersive multimedia learning experience, “bad” narration can turn them off. At Briljent, much of our e-learning contains narration. This is done to either create a more immersive multimedia experience for the learner and/or ensure greater compliance to Section 508 standards. As you may know, Section 508 of the Rehabilitation Act of 1973 requires federal agencies (and those projects receiving federal funding) to make their Electronic and Information Technology (EIT) accessible to people with disabilities. While additional development strategies/workarounds are needed for full 508 compliance, narration is one component that could help make our e-learning courses more accessible to learners with low vision or sight disabilities. So, how do you create good narrations? In this blog, I will outline some major narration missteps and tips to avoid making them. Then, I will outline steps to create engaging narration that can transform your course from good to fabulous. Make sure there are not any meetings in progress around your recording room. For example, in Briljent’s Indianapolis office, our recording room has the least amount of heating, ventilation, and air conditioning (HVAC) sound. It is also physically located away from the rest of the office, resulting in very little noise pollution. However, it is right next door to another Conference Room. If there is a loud meeting next-door, we cannot record narrations, as our sensitive microphone picks up these voices. Audio leveling software is a narrator’s friend. At Briljent, we use software from The Conversations Network called The Levelator. Sure, a narrator can try to keep the volume of his or her speaking voice the same level throughout recording, but it is difficult to do, especially if there are a lot of narrations to record! Also, narrations sometimes must be recorded on different days. How do you make sure that you sit at exactly the same distance from the microphone and speak at exactly the same volume on both days? The answer is: you cannot. This is where The Levelator software can help. Once installed, all you have to do is drag a group of audio files over to the CN Levelator icon on your desktop, and the software automatically adjusts the volume levels throughout the recording(s) for you. 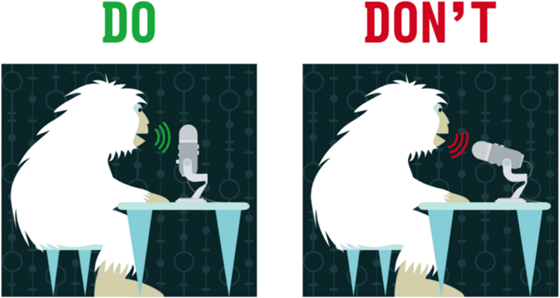 When recording, speak about 3 – 6 inches away from the microphone to get a good signal-to-noise ratio. The signal-to-noise ratio is the level of a desired audio signal (narration) compared to the level of the background noise (HVAC and other noise pollution). If you are farther away from the microphone, the recorded sound of your voice will be quieter, while the background noise sound will remain the same level. The Levelator process will increase the volume of a quiet/distant voice in the recording, but will also increase the background noise by that same amount, resulting in an audible “hiss” or “hum” in the background. It is always better to speak close to the microphone in the first place, as this will result in a better signal-to-noise ratio, and The Levelator will not increase the background noise as much. There are two types of narrators: those who read, and those who act. You want to be the second type.Have you ever listened to a Book on CD? Have you noticed that in the most engaging Books on CD, narrators do not actually “read” the book? Instead, they carry on a conversation – they “act” as if they are each of the characters. Even when they are not being a character’s “voice” and are just describing a scene, they bring the scene to life. A good Book on CD narrator describes the scene to the listener as if he or she is carrying on a conversation with the listener – the narrator does not just read the scene to the listener. Do not stress out your learners with fast, frantic speech. Narration is not a timed exercise – you do not need to rush to speak a sentence in a short period of time. You also should not bore your learners by talking too slowly. Just speak at a normal pace. Sure, your learners cannot see you gesturing to emphasize a point. They also cannot see you when you smile or when you frown or look confused. However, learners can pick up on your tone. Your tone automatically changes to match your hand gestures or facial expression.So, when you smile, gesture, frown, or make any other types of hand gestures and facial expressions, the learner will most likely notice the change in your tone, which adds to the impression that you are talking with the learner, not at him or her. Have you ever given a speech? Did you practice your speech before you gave it, or did you wing it? You probably practiced it so you could feel more confident in your speech delivery, perfect your “tone,” and make sure you did not say so many “Ums” and “Uhs” while you gave your speech.It is the same thing with narration. You need to practice your speech so you do not trip over the words, put in too many pauses, or sound unsure of what you are saying. Also, because Briljent’s courses include a LOT of acronyms, you need to practice these before you say them. Be sure to check with the instructional designer on the pronunciation of acronyms prior to recording.A confident, fluent narrator is a more engaging narrator. If you are still not sure if your narrations are engaging enough, get a second opinion! Do not try to judge your own narrations. If you are anything like me, you probably hate listening to your own recorded voice.Instead, ask someone else to listen to your narrations. If that person thinks you sound engaging and add interest to the course, then you probably do. Be kind to your talent. Let’s face it. Most of us at Briljent would not list narrator as one of our top ten skills. But, due to project budgets and time lines, Briljent employees are usually the only narrators available. Do not expect perfection out of your narrator. Give the narrator the guidance and instruction needed to record the narration you want to the best of his or her ability. For instance, I recently needed a male coworker to record a narration for a doctor in one of my e-learning modules. This “doctor” was a difficult and not very honest character. I explained this to my coworker and told him what I needed, so he knew what tone to use while recording this narration. He did a great job, and my course benefited from his narration. Do not expect your narrator to read your mind. Give your narrator the context of the course and describe the character so he or she can give you the narration you need. Also, respect your narrator’s time. Our Briljent coworkers are working hard on various projects. Do your best to work around their schedules, and express your appreciation for the time they are taking to help you with your project. Finally, praise and thank your narrator. It is hard work to try to bring a narration to life in front of a microphone. It is also a little nerve-wracking to know that a lot of learners are going to listen to your voice. Most people get some performance anxiety in these situations – I know I do! Those are my tips for making a great e-learning narration!